Value Added Programs are an important aspect in raising healthy stock. Please take the time to review our Value Added Programs. If you have any questions please call us anytime, we would be happy to help you figure out a program that will work for you. Also please find a copy of our Market Health Record Cards. When you bring your cattle to market take a minute to fill out the card, this will help us better market your cattle by sharing with our buyers what you have given your cattle. 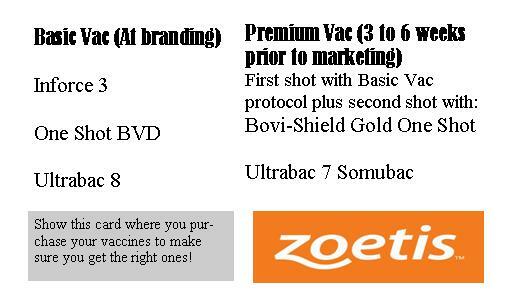 Premium Vac….same shots at branding as basic vac but add a second round of shots 3 to 6 weeks prior to marketing. Second round of shots should include Bovishield Gold One Shot, Ultrabac 7 Somubac, NO Inforce 3 with second round of shots. The premium vac is preferred and highly recommended. Deworming and mineral and nutrition supplements. Mineral and nutrition supplements ARE VERY IMPORTANT and can be area specific, examples of minerals that may be necessary are Selenium bolus, copper bolus and or a vitamin/mineral supplement. It is very important to note that mineral deficient calves do not respond well to the vaccine and do not develop an immune system like those with their proper mineral/nutritional needs taken care of. Also consider the new Pinkeye implant if you are in an area where pinkeye has been a problem. Other value added programs offered are Age/Source Verification, Natural Verification, and NHTC Verification. As always please call me anytime with questions or concerns on what may be the best way to mange your vaccination and value added programs, I am happy to help any way I can! Also please remember, the important part of shots is that you give them and you follow a guideline to which vaccinations are most important, the brand name is not the most important part.